Metal slab superlens-negative refractive index versus inclined illumination: discussion, L. Grave de Peralta, JOSA A 32, 1729-1735 (2015). 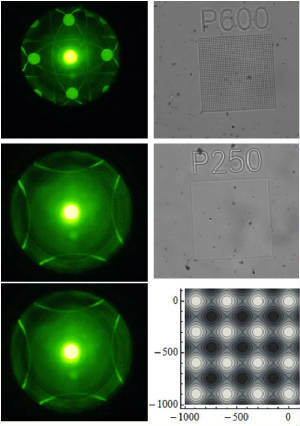 Fourier plane imaging microscopy for detection of plasmonic crystals with periods beyond the optical diffraction limit, D. Dominguez, M. Alhusain, N. Alharbi, A. A. Bernussi, and L. Grave de Peralta, Plasmonic 10, 1337-1344 (2015). Fourier plane imaging microscopy, D. Dominguez, M. Alhusain, N. Alharbi, A. A. Bernussi, and L. Grave de Peralta, J. of Appl. Phys. 116, 103102 (2014). Fundaments of optical far-field subwavelength resolution based on illumination with surface waves, R. Lopez-Boada, C. J. Regan, D. Dominguez, A. A. Bernussi, and L. Grave de Peralta Opt. Express 21, 11928(2013). Far-field optical superlens without metal, C. J. Regan, D. Dominguez, L. Grave de Peralta, and A.A. Bernussi, J. Appl. Phys. 113, 183105 (2013). Probing photonic Bloch wavefunctions with plasmon-coupled leakage radiation, C. J. Regan, O. Thiabgoh, L. Grave de Peralta, and A.A. Bernussi, Optics Express 20, 8658 (2012). Equifrequency curve dispersion in dielectric-loaded plasmonic crystals, C. J. Regan, L. Grave de Peralta, and A.A. Bernussi, Journal of Applied Physics 111, 073105 (2012). Direct Observation of Photonic Fermi Surfaces by Plasmon Tomography, C. J. Regan, A. Krishnan, R. Lopez-Boada, L. Grave de Peralta, and A.A. Bernussi, Applied Physics Letters 98, 151113 (2011). Study of plasmonic crystals using Fourier plane images obtained with plasmon tomography far field superlenses, R. Rodriguez, C. J. Regan, A. Ruiz Columbié, W. Agutu, A.A. Bernussi, and L. Grave de Peralta, Journal of Applied Physics 110, 083109 (2011). Image formation in wide-field microscopes based on leakage of surface plasmon-coupled fluorescence, S. P. Frisbie, C. Chesnutt, M. E. Holtz, A. Krishnan, L. Grave de Peralta, and A. A. Bernussi, IEEE Photonics Journal, 1, 153-162 (2009). Erratum_Some consequences of experiments with a plasmonic quantum eraser for plasmon tomography, A. Houk, R. Lopez-Boada, A. Ruiz-Columbie, S. Park, and A. A. Bernussi, and L. Grave de Peralta, J. of Appl. Phys. 109, 119901 (2011). Plasmonic implementation of a quantum eraser for imaging applications, J. Ajimo, M. Marchante, A. Krishnan, A.A. Bernussi, and L. Grave de Peralta, J. of Appl. Phys. 108, 063110 (2010). Study of interference between surface plasmon polaritons by leakage radiation microscopy, L. Grave de Peralta, J. Opt. Soc. Am. B 27, 1513 (2010). Phenomenological quantum description of the ultra fast response of arrayed waveguide gratings, L. Grave de Peralta, J. of Appl. Phys. 108, 103110 (2010). Interference in wave-front-division-based spectrometers illuminated with ultra fast pulses of light, L. Grave de Peralta, Journal of Applied Physics, 105, 013111 (2009). Ultra fast response of arrayed waveguide gratings, L. Grave de Peralta, A.A. Bernussi and H. Temkin, IEEE Journal of Quantum Electronics, 43, 473 (2007). Temperature insensitive reflective arrayed waveguide grating multiplexers, L. Grave de Peralta, A. A. Bernussi, V. Gorbounov, and H. Temkin, IEEE Photonics Technology Letters, 16, 831, (2004).